It’s 5:55 p.m. You’ve opened the fridge, the pantry, and the fridge again, hoping something will catch your eye that you can make for dinner that night. You used the last of the frozen pizzas saved for such occasions last night, and you’re fresh out of ideas. Uninspired, you pick up the phone and order delivery. Does this sound like you? Me, too sometimes. It’s no wonder that dinnertimes in many households consists of “kids’ dinner” at one time – a hastily-prepared plate of hotdogs, buttered noodles and peas – with dinner for the parents happening later…or with one parent picking off the kids’ plates, and the other popping in a Lean Cuisine or picking up take-out on the way home. This is despite numerous studies showing that families who eat together at home have healthier meals (the subject of a previous post). And while the “six p.m. scramble” happens to the best of us, there are simple ways to help avoid it, as long as you plan ahead. 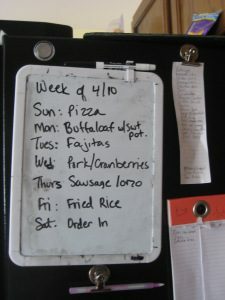 In my family, we take about 5 minutes on either Saturday or Sunday morning to plan the dinners for the following week. Really – 5 minutes is all it takes! Not only does it save us time each night and helps us avoid the fridge/pantry/freezer shuffle, but it saves us money, time and food, too. That’s because having a menu helps me plan my grocery shop for the week (which inevitably is done later that Saturday or Sunday) and prevents daily trips to the grocery store for a single ingredient. We start by having a list of dinners that we often make. When we’re in a dinnertime rut, we refer to the list to see if there’s anything we haven’t had in a while. If there’s still nothing that strikes our fancy, then we consult a cookbook and decide to try something new. If a list sounds too boring for you, or if you want to get your kids involved in meal planning, you can create a “wheel of dinner” to spin around – where it stops will be the meal for the given day. Or, put all your favorite dishes in a hat and have every family member take turns pulling one out. Some families consult the weekly circular from the grocery store, see what’s on sale, then decide meals from there. Whichever method you choose is fine – the key is to do it in advance! The menu board itself doesn’t have to be anything fancy – we use a magnetic whiteboard that hangs on the side of the fridge. Makes for quick updating and is conspicuous enough for everyone to know what’s on tap for the week, without looking like a restaurant menu board. Another tip to make meal-planning easy is to designate regular theme nights or have a go-to dish that makes an appearance each week or bi-weekly. In my house, we have a chicken-apple sausage and orzo dish that everyone likes and is easy to make. It appears on the menu nearly every week. We also designate Saturday night as “cook’s night off” so we order in or raid the freezer for leftovers, and Sundays are almost always pizza night (toppings may differ week to week). Maybe in your house you can institute a breakfast-for-dinner night, or a kids’ choice night – whatever will get the whole family involved and get everyone to the table together. Great advice, Elana, people will plan their workday because they know it will enhance productivity, etc., but the forget about their meals which is just as important, and it actually provides a net time savings! But I have to ask, what exactly is a “Buffaloaf”? Buffaloaf is meatloaf made with buffalo meat instead of beef. It’s often leaner, and very tasty! I got the recipe from the Colorado Dietetic Association cookbook: mix together 1 lb ground buffalo meat, 2/3 cup regular oats, 1/3 cup BBQ sauce, 1 egg, 1/4 cup chopped onion, 1/4 cup chopped green pepper, 1 Tbsp dried parsely flakes, 2 tsp Worcestershire sauce. Cook for 40 min-1 hr. For portion control, I bake it in a muffin tin (3 “muffins” = 1 serving). Serve with sweet potatoes or sweet potato fries. Yum!